A female staffer said one of the senator's aides often made crude remarks. Sen. Kirsten Gillibrand, a 2020 presidential hopeful who has made fighting sexual assault the focus of her political career, is pushing back against claims made by a female staffer in her office who says she resigned last summer in protest over the office's handling of a sexual harassment complaint against a top aide. When reached by ABC News late Monday, Gillibrand told ABC News she has no regrets about the way the claims were handled as outlined in POLITICO . "We conducted a thorough and professional investigation, and the person who was accused was punished," Gillibrand said. Gillibrand’s office maintains that they took immediate action at the time the initial complaint was made in consultation with Senate Employment Counsel and included multiple interviews with relevant current employees who could corroborate the claims. “A full and thorough investigation into the evidence revealed employee misconduct that, while inappropriate, did not meet the standard for sexual harassment. However, because the office did find unprofessional behavior that violated office policy, including derogatory comments, the office took strong disciplinary action against the employee in question and he was given a final warning,” Gillibrand’s communications director Whitney Brennan said in a statement to ABC News. The male staffer was later fired. The female staffer alleges she told the senator’s staffers last summer that one of Gillibrand’s closest aides repeatedly made unwelcome advances and crude, misogynistic remarks in the office about other female colleagues and potential female hires after he was promoted to a supervisory role, according to POLITICO. 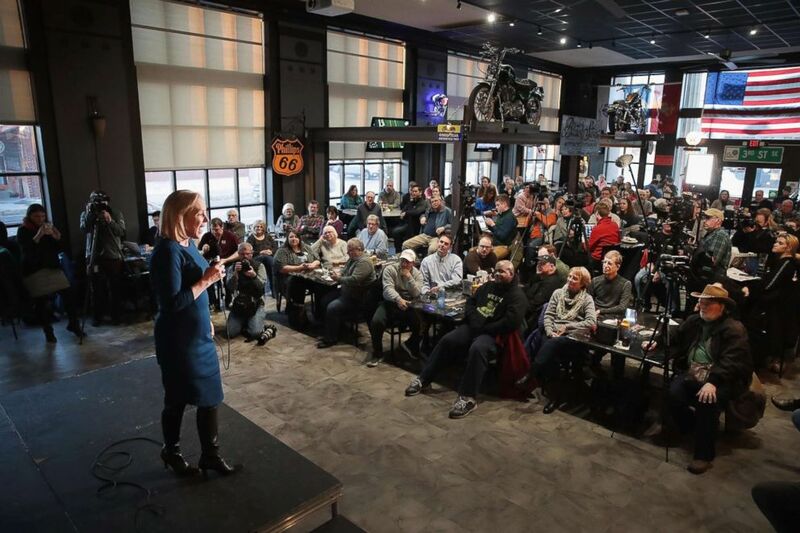 (Scott Olson/Getty Images, FILE) Sen. Kirsten Gillibrand speaks to guests during a campaign stop at the Chrome Horse Saloon on Feb. 18, 2019 in Cedar Rapids, Iowa. In a subsequent resignation email which was obtained by POLITICO, the woman claimed she was leaving her post because of how “poorly the investigation and post-investigation,” into the matter was handled. "Your office chose to go against your public belief that women shouldn’t accept sexual harassment in any form and portrayed my experience as a misinterpretation instead of what it actually was: harassment and ultimately, intimidation,” the woman wrote, according to POLITICO. The correspondence appears to have been sent to the senator’s personal email account on the staffer's final day – less than three weeks after she reported the alleged harassment. ABC News has not spoken directly with the woman nor verified the email. Gillibrand issued a statement to ABC News defending her office’s handling of both the sexual misconduct allegations and the subsequent investigation into the matter. “These are challenges that affect all of our nation’s workplaces, including mine, and the question is whether or not they are taken seriously. As I have long said, when allegations are made in the workplace, we must believe women so that serious investigations can actually take place, we can learn the facts, and there can be appropriate accountability. That’s exactly what happened at every step of this case last year. I told her that we loved her at the time and the same is true today,” Gillibrand said. Gillibrand’s office said the male staffer was fired last week after additional “troubling comments” he allegedly made were revealed. “Recently, we learned of never-before-reported and deeply troubling comments allegedly made by this same individual. The office immediately began another investigation and interviewed relevant witnesses, which has led to the office terminating the employee from staff last week,” Brennan said in a statement.